Join us at NSLM as Dr. Peter Schertz of the Virginia Museum of Fine Arts presents on the ancient Greek tradition of wine drinking and entertainment: the symposium. Dr. Schertz has served as curator of Ancient Art at the VMFA since October 2006 and the Jack and Mary Ann Frable Curator of Ancient Art since 2007. His specialty is Roman art, with a focus on the intersection of art and culture, particularly art and religion. He is particularly interested in cultural interactions within the ancient Mediterranean world and how new technologies can help us understand and interpret ancient art. 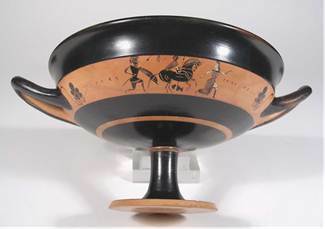 Dr. Schertz is the co-curator of The Horse in Ancient Greek Art exhibition. $5 admission, free to NSLM members.